Are you tired of the snow wherever you are? We've only gotten a tiny bit of snow/ice once last week and once this week, but it sure is pretty to see it fall! The first time it started icing I was already at home with the day off, and I was in the middle of making these cinnamon rolls. It was the perfect snow day (sort of) activity: the snow was falling outside and I was inside all warm and cozy with my dough rising. These cinnamon rolls are the best homemade cinnamon rolls I've ever had, no lie. They rose beautifully (I'm very picky about that) and had just the right amount of filling and icing for each cinnamon roll. This has become my go-to cinnamon roll recipe. I hope you have a warm and cozy weekend, complete with fresh cinnamon rolls. Add 3 cups of flour, salt, and egg and mix on low until combined. Switch to the mixer's dough hook. Add remaining cup of flour and knead dough for a few minutes until it pulls away from the bowl. If needed, add another tablespoon of flour to help all the dough completely pull away from the sides of the bowl. Spray a medium bowl with non-stick cooking spray. Remove dough from mixing bowl. Knead dough a couple of times by hand and then shape into a ball. Place in coated bowl and turn over to coat each side. Cover bowl with plastic wrap or a clean towel and let rise in a warm spot for 2 to 2 1/2 hours or until dough doubles in size. If dough reaches top of the bowl, punch down. Butter two 8x8-inch pans. Turn the dough out onto a lightly floured work surface. Keep extra flour handy to coat your rolling pin, hands, and work surface if needed. Roll into a roughly 14 x 24 inch rectangular shape with the longest side closest to you. Roll so that the dough is almost 1/4 inch thick. Starting from the side opposite you, roll dough tightly towards you to form a long cylinder of dough. At the end, pinch the seams together and turn so that the long seam side is down. If needed, gently squeeze or shape the dough to help form more equal sized cinnamon rolls. 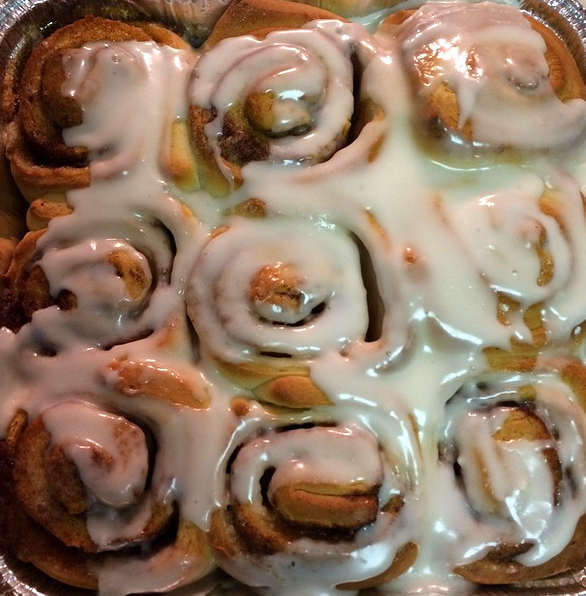 Cut dough shape into 18 1-1/2 inch sections with a serrated knife and place nine cinnamon rolls in each pan. There will be a little space between each roll. Let rolls rise a second time in a warm spot for about 30 minutes. Heat oven to 375 degrees and then bake rolls for 15-17 minutes. While the rolls are baking, prepare the vanilla topping. Sift confectioners' sugar into a medium bowl. Whisk in melted butter, vanilla, and milk until completely smooth. Remove rolls from the oven and pour topping evenly over cinnamon rolls while warm. Makes 18 cinnamon rolls.